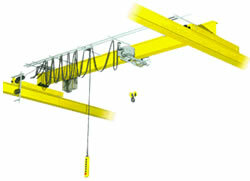 Underslung crane construction from Granada is ideal when floor mounted gantry steelwork is not practical. Typical applications include processes which require large clear work areas such as aerospace or automotive. These can be supplied with a wide variety of control options. Almost limitless spans, profile or fabricated torsional low weight box design. Can be supplied with cab/radio control and full length maintenance platforms. Standard SWL up to 80t. Standard ‘MicroMove’ long and cross travel operation for reduced load swing. 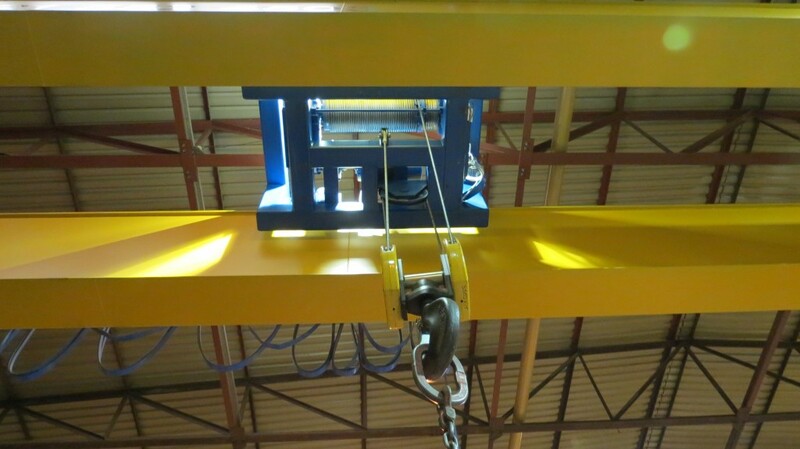 Optional extras include pendant weight monitoring, hoist operation monitoring, special paint finishes and weatherproofing. Profile or box girder design, spans up to 10m and 10t SWL, can be supplied with Cab/Radio control. New ‘Nova’ wire rope hoist offers easy and effective load handling, exceptional performance, superior safety and long lasting reliability with a new revolutionary compact design. We can create a complete factory material handling ‘fly through’ to ensure your proposed system works prior to manufacture and installation.